This is the second article in a series on how calcium and other nutrients end up inside our vegetables, and on how to interpret certain soil test results. You can read the first part here. The soil needs to store the weathered bedrock calcium, keep it from leaching away to where the plant roots can’t reach it. Certain clays (very fine inorganic particles) and organic or humus particles form colloids: thin, flat plates with a large surface area that has a negative electrical charge. As such they attract or adsorb large quantities of positively charged ions, or cations (pronounced cat-eye-ons), which comes to adhere to it with a weak electrochemical bond. As the cations are taken from this storehouse by plant roots (see 6), other cations in the soil water replace them on the colloid. This is called cation exchange. For example, hydrogen (H+) is such a cation, and it’s part of H2O, so water molecules are attracted by the clay’s negative electrical charge. That is why clay is good to have, since it holds on to water so well. But if your soil is mainly clay, it’s not so good, because the clay will lock the water molecules into bond that is so strong that the plants’ roots will not be able to break it. So the soil may hold a large amount of water, but much of it is actually not available to plants. On the other hand, a soil that is too sandy) will not be able to hold on to anything, water or nutrients, because sand particles have no electrical charge. Cations will compete with one another for a place on the colloid. Some are charged more than others, for instance, calcium (Ca++) is charged twice as much as hydrogen (H+), and aluminum (Al+++) is even stronger. An aluminum cation borne along by the soil water can easily knock a hydrogen cation off the colloid and take its place. If the soil water bears a high concentration of a particular cation, those cations will replace other cations on the colloid, for instance, a swarm of calcium ions against one sodium (Na++) ion. The stronger the colloid’s negative charge, the greater its capacity to hold the positively charged cations. 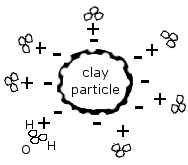 The kind of clay (for more details, see here), its mixture with sand and organic matter and its crumb structure, all determine the soil’s capacity to hold cations against leaching. This capacity is termed the soil’s cation exchange capacity (CEC) – an important term on your soil test results. This CEC is expressed in milliequivalents per 100 grams (meq/100g) of soil or in centimoles of positive charge per kilogram of soil (cmol(+)/kg). 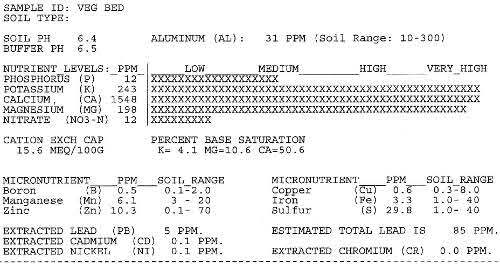 On our soil test results the CEC is given as 15.6 meq/100g. So, in every 100 grams of our soil, 15.6 meq of soil can hold onto the goodies, calcium (Ca++), potassium (K+) and magnesium (Mg++), that come along in the soil water, as well as hydrogen (H+), and sodium (Na +) and aluminum (Al+++), which are not plant nutrients. That explains at least one unknown on that soil test! Next up, in Part 3, the role of water in all of this: it is, after all, the soil water that brings and that can take away these cations. I am finding your posts on calcium interesting. In part 1 you said you found egg shells, bones, after one year. So, why weren’t they decomposing? I have very clay soil to which I have added a lot of ammendments. 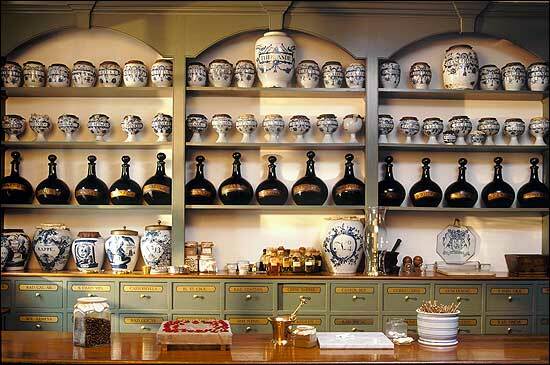 The ammendments, such as compost, peat moss, vermiculite and manure have helped a lot. But, I have no idea if my soil is healthy. I bought a soil test kit but haven’t gotten it together to actually test it. I’ve never tested soil before. How much does it cost to get a professional test (like you showed in your blog part 2)? My soil test, sent in to the extension office, cost only $9: this provides pH, Buffer pH, Extractable Nutrients, Extractable Heavy Metals (e.g.. Lead), Cation Exchange Capacity, and Percent Base Saturation, plus recommendations for nutrient and pH adjustment. For an extra $4 I could get the percent of organic matter tested as well. I’d check at your State extension office. I don’t think a home-done test can get all this information. At first I wasn’t so much interested in the fertility of my soil – I was observing it closely and found it ok – but in the possibility of there being lead in it. But once I got the test and started investigating all that info, I’m glad I got it done. 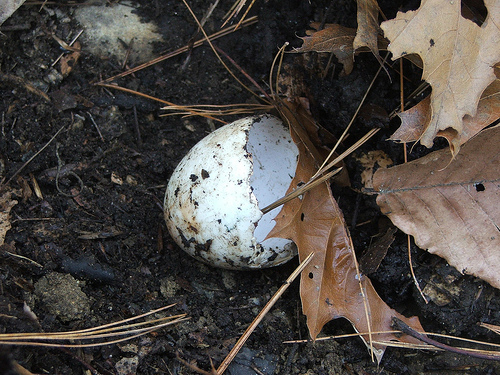 As to why the bones and eggshells weren’t decomposing, I will get to that in part 6. Or was it 7? Thanks for your response! Based on what you’re saying, I definitely want to get my soil tested. I recently read the term “ask your local extension” in an organic farming book I’m reading. I have no idea what that means. I thought they might be referring to an education “extension” to a University. We have those in Southern California (e.g. UCSD Extension). Can you shed more light on what you mean by “sent in to the extension office”? I spent more for a home kit than the cost you mentioned to have it done professionally. I think I’ll go ahead and use my soil tester, but, it sure would be nice to have more accurate details. I look forward to reading your follow up blogs. I would test the soil, if only to know it better. If your home test is anything like our fish tank water test, you can use it several times. What I would do is have the soil professionally tested, then adjust if necessary, and then use the home test for follow up. You’re right, the “extension office” *is* an agricultural extension of the state university and they do this kind of thing (some of them also check the gauges on pressure canners, mine doesn’t). I did a quick search online and didn’t find one in Southern California (very strange). But I found this: “Lists of labs are available by contacting the Natural Resources Conservation Service (NRCS) at (626) 312-4900” (http://celosangeles.ucdavis.edu/garden/articles/startup_guide.html). I hope that helps. You know, you could of course also send it further away – the postage won’t cost you much more, and the test might be cheaper. Good luck! I have clay soil too so this post was highly interesting. CEC was one of the things I had to look up when I got my first soil test back, but I have to say that your explanation is so much better than anything else I found about it.